We are looking at butter knives lately and this one is pretty interesting. At first it looked like it was an electrically warmed piece of cutlery but this knife has a different low tech trick. The Serrated Warming Butter Knife and Spreader from That! Inventions uses the heat of your hand to heat itself up. 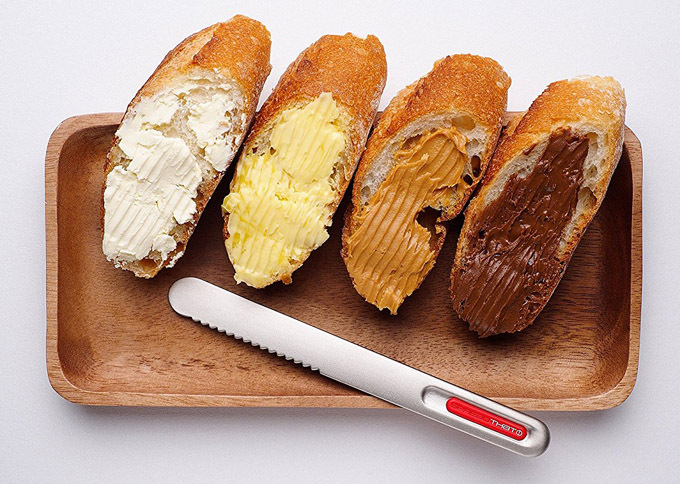 Made of dishwasher safe super-efficient copper heat-transfer core and a titanium shell heat conducting technology that utilizes your body heat to carve and spread cold butter. There is also a flat and a serrated side of the spreader. Oh yeah, and it works well for butter, peanut butter, chocolate spread, cream cheese, and Nutella!